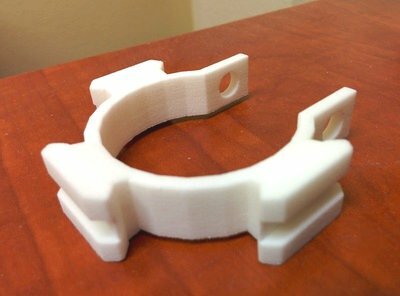 We have been using Sculpteo's 3D printing service to produce parts that we desire with great success. 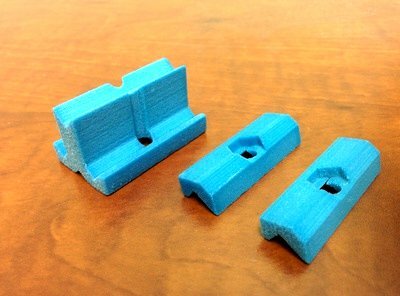 In this article, we want to document our experience with the handling of various materials that we printed through Sculpteo. The multicolor 3D printed material is nice for models that are colorful. However, it is hard and brittle. If you apply force to it, it will crack and break apart. It's great for decorations and models that is free of stress. It's not so good for mechanical parts that needs to be screwed or tied down (stress). The above photo is an example of multicolor parts. It has a matte texture surface that feels like sandstone when you touch it. Sculpteo sent us this red alien model (see photo below). It is 3D printed out of red polished plastic. It's characteristic is very similar to the while raw plastic (see section below). The plastic is bendable and not brittle. The alien character is just too cute for us to cut into it or experiment with it. Drilling requires torque. Once the drill bit has cut into the plastic, you really can't manipulate the depth like wood; it will completely drill through. The plastic is really tough, so the drill bit will grab onto the part. That means holding the part by hand is extremely dangerous; it can rip your hand. You must clamp the part down with a vise or clamps to drill it. Therefore, specialized holes should be modeled and printed, not drilled later on.